Indusquip Marketing's recent display stand at Electra Mining Africa 2012 from 10 to 14 September 2012, was highly successful. Product launch of the New GD300 INVT range of Variable Speed Drives in South Africa has been met with much interest and approval. The GD300 range has been available in China for sometime wherein the product is fully tried and tested prior to being launched to Export markets around the world. INVT expend approximately 6% of their total turnover on Research and Development and Indusquip look forward to prospects of further new designs and improvements in the near future. INVT is able to manufacture Medium Voltage AC Drives up to 7100kW in voltages 2.2kV, 3,3kV , 3,3kV, 6,6kV and 11,0kV. 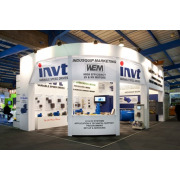 Indusquip also showcased some of the new INVT products which will also be available in South Africa, namely EMC filters, PLC's and HMI screens. 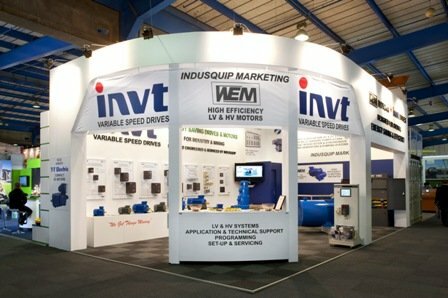 The WEM standard range of High Efficiency Cast iron IP66 - Class H (SABS Approved ) motors and WEM Aluminum motors with additional bolt-on force cooling units for VSD application were well represented on display.